promoting or entering a lottery. a game where a computer generates images or data taken to represent the actions of another participant or participants in the game. any scheme for the distribution of prizes by chance or lot in which the participants or a substantial number of them make a contribution for the purposes of participation in the chances of the lottery and includes tombola, but does not include any gaming. in breach of copyright laws. As highlighted in Section I.ii, above, the principal legislation governing gambling activities in Gibraltar is the Gambling Act. 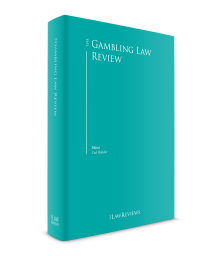 The Gambling Act sets out a licensing and regulatory framework for both land-based gambling and remote gambling. The definitions of gambling and gaming are set out in Section I.i, above. The different categories of gambling include betting (such as pool betting) and bookmaking, gaming and lottery. The ‘gaming’ element includes all types of casino games, poker, slots, machine gaming, bingo and all other number games without limitation. The Gambling Act provides for both land-based and remote gambling. While both are catered for in the legislation, the respective licensing regimes and requirements are different, as set out in subsections iv and v, below. pay all such charges, fees and gaming taxes as are prescribed by the Licensing Authority. Bookmaker’s licence: this allows the holder to undertake, either on his or her own account or as agent, the business of receiving or negotiating bets. Furthermore, it should be noted that it shall be an offence for any person to keep or use any premises, or cause, or knowingly permit any premises to be used as a place where persons resorting thereto may effect any betting transactions without having previously obtained a bookmaker’s licence. Pool promoter’s licence: this allows the holder to run pool betting operations. Strict restrictions are imposed on the use of premises for the provision of pool betting services where the owner of such premises does not hold a pool promoter’s licence. Gaming operator’s licence: this allows the holder to conduct or provide gaming facilities (this includes the provision of games of chance for a prize, such as casino games). Restrictions are also imposed on the use of premises to conduct gaming operations. Lottery promoter’s licence: this allows the holder to promote or operate lotteries. Gaming machine licence: this allows the holder to keep on his or her premises gaming machines for the purpose of land-based gaming services. The Gibraltar government conducts a lottery. The Gambling Act prohibits land-based lotteries operating in Gibraltar other than the Gibraltar government lottery and other small bazaars, fete and fairground style lotteries (of the types identified in Schedule 2 of the Gambling Act). No similar restrictions apply when conducting online lotteries from Gibraltar targeted at end users located outside Gibraltar. any other electronic or other technology for facilitating communication. The Gambling Act only envisages one type of remote gambling licence: the operator licence. There are, however, subcategories of this licence depending on the nature of the services provided, which are ‘casino’ (including poker, bingo, slots), ‘betting’ and ‘lottery’. A draft report has been prepared for the Gibraltar government’s consideration by a working group established for such purposes. A paper was circulated within the industry and given to interested stakeholders, and the anticipated responses will feed into the analysis of the changes proposed. This envisages building on the strong regulatory licensing and tax regime already in place. The less prescriptive environment into which Gibraltar and the United Kingdom may be moving may indeed provide space for further reforms and adjustments. Gibraltar has built up a critical mass of knowledge, personnel, regulatory experience and political support for the online gaming industry. These features and the jurisdiction’s broader attractions remain in place. Gibraltar is determined to ensure that its economy remains highly competitive and very attractive as a base from which to operate international business. the proposed control measures and procedures to seek to identify money laundering and other suspicious transactions. There is a £10,000 fee payable on application and a £2,000 annual renewal fee. Quite separately, there are gaming charges applicable (see Section V, below). Quite apart from the specific obligations and conditions that a licence holder needs to comply with depending on whether it is offering remote or non-remote gambling services, each licence holder is obliged to follow the same rules (a–g) as provided in Section II.iii, above. See Section III.ii, above, regarding enforcement provisions in Part VIII of the Gambling Act. The Act imposes significant penalties on those persons providing remote gambling services without having previously sought and obtained the relevant approvals and licences – see Section III.ii, above. Gibraltar has enacted legislation to comply with the EU’s Fourth Money Laundering Directive (the Directive). The primary piece of legislation in this area is the Proceeds of Crime Act (POCA). The Act contains a number of sections relating to anti-money laundering (AML), and the Terrorist Asset-Freezing Regulations 2011 are also applicable in the jurisdiction. In particular, Section 33 of the Gambling Act 2005 stipulates that all remote and non-remote gambling licensees must comply with the provisions of the POCA. In addition, the licence conditions for remote gambling operators provide that remote gambling licensees need to ensure compliance with the Financial Service Commission (FSC) Guidance Notes on AML and related matters (in addition to the separate Codes of Practice issued by the Gambling Commissioner). Under the POCA, the Licensing Authority is designated as the supervisory body for AML in the gambling industry. The Gambling Commissioner is empowered to issue guidance notes and to monitor the gambling industry’s compliance regarding anti-money laundering and terrorist financing. The corporate tax system was introduced on 1 January 2011 and established a 10 per cent rate, though it may be possible to mitigate this in the appropriate circumstances. Separately, gambling operators in Gibraltar are also subject to certain duty charges. This is levied at a rate of 1 per cent of turnover in respect of betting services and 1 per cent of gaming yield in relation to gaming services (casino and poker), but is subject to a minimum of £85,000 a year and a maximum of £425,000 a year. It is likely these arrangements will change as part of the review of the gambling legislation that is under way. 1 Andrew Montegriffo and Louise Lugaro are associates at Hassans International Law Firm.